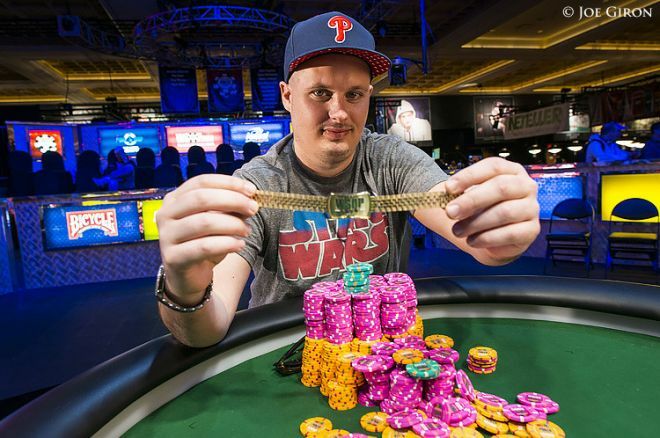 Two more bracelets were won at yesterday’s 2014 World Series of Poker, with Paul Volpe’s triumph over a tough final table and heads-up opponent in Daniel Negreanu in the Event #13: $10,000 No-Limit 2-7 Draw Lowball Championship grabbing the day’s headlines. Volpe earned his first-ever bracelet after having bubbled the final table in the same event a year ago. 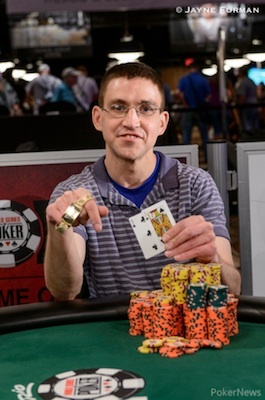 Meanwhile, Gregory Kolo picked up his first WSOP bracelet as well — and first WSOP cash — by winning Event #12: $1,500 Pot-Limit Hold’em. Just eight players remained out of the 557 starters in Event #12, with Kolo returning as the chip leader. Along with Phil Collins who busted late on Day 2 in ninth, there were two other players who made the final eight who had made WSOP final tables before — Dean Bui and Tom McCormick — but all coming back Thursday were seeking a first WSOP bracelet. The pace was especially fast yesterday, and it would take only 74 hands and two-and-half hours for seven to bust and Kolo to emerge as champion. Kazu Oshima who began the day in second position was responsible for several of the bustouts, but at three-handed Kolo still retained the lead. Kolo then ousted Bui in third after his outdrew Bui’s by drawing an eight-high straight. Six hands later Oshima called a preflop raise from Kolo, then check-raised a flop and Kolo called. Oshima led the turn and was called, then shoved the river and Kolo called him again. Kolo then turned over for a flopped two pair, while Oshima had barreled away all of his chips with . McCormick, who busted in fifth, made his 12th WSOP and 46th cash in this event, and he remains one spot behind Tony Cousineau (who also cashed in Event #12) on the “Most Cashes Without a WSOP Bracelet” List. Meanwhile of the seven returners from the starting field of 87 who came back for Event #13’s final day of play yesterday, six had won bracelets before with chip leader Volpe the only one seeking his first. Abe Mosseri was the first eliminated on Day 3, falling in a hand versus Larry Wright. Both Mosseri and Wright entered yesterday having won one bracelet before, both in “deuce” events (Mosseri’s in limit triple draw, Wright’s in NL draw). Soon after two-time bracelet winner John Monnette was knocked out in sixth by another two-time champ, Jason Mercier, and not long after Volpe ousted Wright in fifth. Of course, many eyes were on Daniel Negreanu who hoped not just to secure a seventh WSOP bracelet, but also to win significant side bets that either he or Phil Ivey will win an event this summer. His chances yesterday brightened after knocking out two-time WSOP event winner Brian Rast in fourth to set up what would be a lengthy three-handed battle between himself, Volpe, and Mercier. It would take 65 more hands before Volpe knocked out Mercier in third. In the latter’s final hand, Mercier was drawing to a better hand than Volpe with versus the chip leader’s , but both picked up fours which made an eighty-seven low for Volpe but paired Mercier to end his Event #13 run. Volpe began heads-up with a nearly 2-to-1 chip advantage over Negreanu, and while their duel was lengthy — lasting 85 hands — Negreanu was never able to chip up to close the gap. Finally the end arrived in a hand that saw Negreanu all in before the draw with against Volpe’s . Volpe showed first, turning over a for a J-10-7-6-3, then Negreanu squeezed his last card — a — to make a worse Q-J-6-5-4. Volpe’s win puts him up close to $450,000 in career WSOP earnings and near $2.7 million lifetime in live tourney cashes. The tournament’s final act recalled the conclusion of last summer’s $2,500 2-7 Triple Draw event when Negreanu lost heads-up to Eli Elezra, and while the outcome disappointed Negreanu’s many fans it also delighted those who’ve bet against him and Ivey this summer. Day 2 of Event #14: $1,500 Limit Omaha Hi-Low saw 220 players come back from the huge starting field of 1,036, and after 10 one-hour levels that group had played down to 26 with Dan Hirleman of Tempe, Arizona finishing with the biggest stack of 353,000. Alexandre Luneau, Konstantin Puchkov, Dan Heimiller, Frankie O’Dell, Daniel Makowsky, and Greg Raymer are among those with above average chips heading into today’s final scheduled day of play. Also still in the hunt is last year’s winner of this event, Calen McNeil, who after starting Day 2 low on chips managed to survive to today with just under an average stack. Meanwhile Maria Ho and Chris Tryba are among those making it to the end last night with short stacks. As the evening wound down and after the money bubble burst at 117 players, some of those eliminated during the night’s final levels included Dan Kelly (48th, $5,160), Robert Mizrachi (43rd, $6,041), Mickey Appleman (36th, $7,146), Erik Seidel (34th, $7,146), and Alexander Kuzmin (32nd, $7,146). Event #15: $3,000 Six-Handed No-Limit Hold’em saw 810 players take part, three more than the total for last year’s version of this event, thereby creating a $2,211,300 prize pool to be divided among the top 90 finishers with $508,640 due the winner. They played down to 144 last night, with Brandon Cantu picking up chips near night’s end to finish as the end-of-day chip leader with 244,700. That hand helped Cantu move ahead of Barry Hutter who ended Day 1 in second position, with Andreas Hoivold, Davidi Kitai, Byron Kaverman, and Chris Hunichen also having ended the evening in the top 10, and Michael Mizrachi hovering close as well. Then late in the afternoon Thursday, Event #16: $1,500 Limit 2-7 Triple Draw Lowball got going with 348 players showing up to build a $469,800 total prize pool. The top 36 finishers will divide that money with $124,510 sitting up top for the eventual winner. They played 10 one-hour levels on Thursday, with Canada’s Mike Leah ending the night with the most chips among the 51 survivors after spinning his 4,500-chip starting stack up to 91,800. Also ending the night well was Jason Mercier, fresh from his third-place showing in Event #13, who joined Dan Smith and others finishing among those in the top 10. Ismael Bojang, Ben Yu, and Naoya Kihara are likewise coming back to relatively big stacks on Friday. Action gets going earlier than usual at the WSOP today with the 10 a.m. start of the Event #17: $1,000 Seniors No-Limit Hold’em Championship, a tournament that in recent years has drawn an increasingly large turnout. Meanwhile Events #14, #15, and #16 will continue play, with Event #14 scheduled to reach a conclusion tonight. And one new tourney, Event #18: $10,000 Seven-Card Razz Championship, cranks up later in the afternoon.